Organization: Two teams of 6 including the GK&apos;s, plus 1 neutral player. Neutral player always plays for the team in possession. Playing field 60x40m. One goal at each end. all soccer balls in goals and off to the side with the coach. 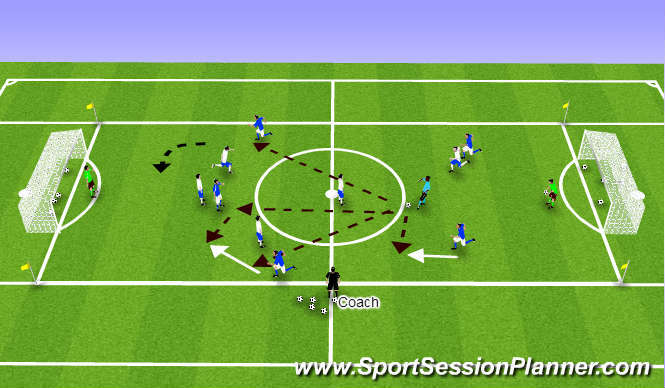 1) The game begins when the GK rolls the ball out to one of his/her players. The team must then interpass in an effort to create scoring opportunities. The opposing team must try and win the ball so that they can also attack and score. Normal rules of soccer with the exception that the ball must be "kicked-in" for re-starts when the ball leaves the field of play. Any balls that go out of play behind the goals are restarted by the GK rolling the ball to on of her/his players. Emphasis should be made of the importance of players using the additional player advantage to create good supporting triangles around the ball. 2) Switch the neutral player every 5-10 minutes. 3) Progression: For the last 5-10 minutes, the neutral player can only receive the ball in the defending half of the field in possession. Coaching Points: Accurate passes with good pace. Open your body to the play when receiving a pass. Principles of play Attacking: Dispersal wide/deep (spread out) Support Angel, distance, time. Make sure you can be seen between players. (Center points, between lines) Penetrate through, around, over, shoot. Break lines with run, passes and dribble.